Bus from KL to Alor Setar remains the favourite choice among passengers even though with the strong challenge from the emerging KTM ETS train service. The reason of the preference is because bus offers the choices of departure schedule all day long against KTM which has limited 4 schedule daily. Intercity Coach, Etika Express and Transnasional are the 3 major players in the market serving the bus from KL to Alor Setar. Their services are almost the same except that Intercity Coach deploys high deck coach to run the bus service. On the other hand, both Etika Express and Transnasional deploy standard 27 seater coach to serve the passengers. Beside the 3 major operators, other operators like Hatyai Intertop, Kejora Express, Konsortium, and Plusliner also provide bus service to Alor Setar from KL. 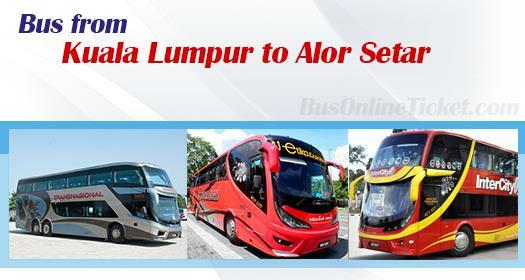 Duration for bus from KL to Alor Setar takes about 6 hours depending on the traffic condition. Coaches depart from TBS (Terminal Bersepadu Selatan), with some coaches will pass by Hentian Duta Station to pick up passengers. Please note that Hentian Duta Station is the bus terminal located at northern area of Kuala Lumpur. Bus from KL to Alor Setar has minimum 1 stopover along the highway for toilet break. The bus fare for from KL to Alor Setar is ranging from RM 42.90 to RM 45.00 depending on your coach choice. All coaches are equipped with advance comfort features like air conditioning and reclining seats to ensure passengers have a comfortable journey to Alor Setar. Taking bus from KL to Alor Setar can prove to be a magnificent experience with the highlight of viewing the exquisite rice field in Kedah State. Now it is even more convenient by booking your bus ticket online at BusOnlineTicket.com with instant confirmation.